Last month NVIDIA silently launched the GeForce 210 and GT 220 graphics cards, which are aimed at the entry level discrete graphics card market. Both cards fall below the $100 price point and are clearly aimed at those that have a desktop system that runs integrated graphics and are looking to be able to add in an inexpensive graphics card that will help boost system performance. Both graphics cards boast nice features like up to 1GB of DDR3 memory, Dual-link DVI and HDMI 1.3a output connections for HDTV's and they have been built using the latest 40nm manufacturing process. If that doesn't sell you, the cards also support NVIDIA PhysX and CUDA technologies, not to mention Microsoft DirectX 10.1 and DirectCompute (a feature found in Windows 7). A quick look at the EVGA website under Graphics Cards will show that they have not one, but five GeForce GT 220 graphics cards on the market and a lone GeForce 210 video card at the bottom of the product stack. With five EVGA GeForce GT 220's being offered today you have a tough choice to make as to which one is right for your particular system. 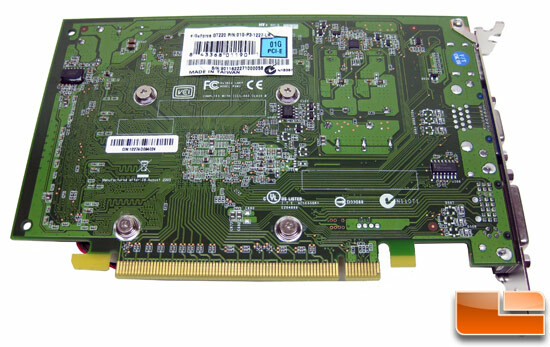 The least expensive GeForce GT 220 would be the 512MB DDR2 version at just $74.99. This card will run fine, but is limited by its DDR2 memory bandwidth. For an extra five bucks you can double the memory up to 1GB, but it is still DDR2. For an extra $10 you can get yourself a card that would be as memory limited and features 1GB of newer, faster, and more energy efficient DDR3 memory. EVGA has three GeForce GT 220 graphics cards that feature GDDR3 memory and those cards differ by the clock speeds on the GPU, shaders and memory chips. These are the three cards that we would suggest investing in from a purely feature perspective. 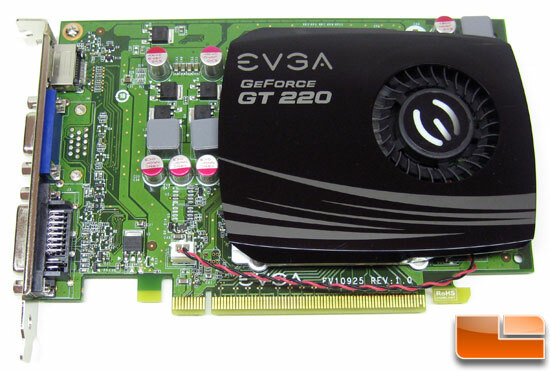 Today, we will be looking at the EVGA GeForce GT 220 SSC DDR3 edition graphics card. This card has a factory overclocked core and shader clock speeds, which should help boost performance over the standard clock speeds of 625MHz and 1360MHz. The EVGA GeForce GT 220 SSC DDR3 has a core clock speed of 671MHz and a shader clock of 1458MHz. This is just over a 7% clock frequency boost on the GPU, so that should help out performance on the card's 48 stream processors. The EVGA GeForce GT 220 SSC DDR3 is a single slot graphics card that has plastic fan housing over the heat sink and features a small cooling fan to keep the card nice and cool. The GeForce GT 220 measures in at seven and five-eighths of an inch in length, so the card should easily fit inside nearly any desktop PC case. Taking a look along the top edge of the card you will notice that it doesn't have any 6-pin PCI-E power connectors on it. This is because the card doesn't need anyexternal power connectors. This is great news for those that own store bought Dell or HP systems as often you don't have any 6-pin PCI-E power connectors available inside your chassis. What size of a power supply do you need to run a GeForce GT 220? NVIDIA recommends that you have a minimum of a 300 Watt power supply with +12 Volt current rating of 18 Amps. Most power supplies have a sticker on the side of them that will show the ratings on it if you are unsure of what you have. The back of the EVGA GeForce GT 220 SSC DDR3 has a serial number sticker on it, in the event card ever needs to be RMA'd, so it is pretty bare and boring as you can see from the image above. This video card is covered by the EVGA two year warranty program, but you must register the product for the warranty to be valid for this length of time. Consumers that fail to register the card within 30 days will get stuck with a one year warranty. 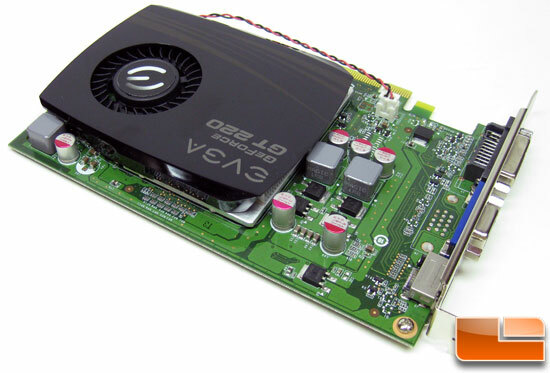 The EVGA GeForce GT 220 SSC DDR3 graphics card has a single VGA and dual-link DVI-I outputs along with an HDMI 1.3s output. Both the Dual-link DVI and HDMI outputs can be used to send high-definition video to an HDTV via single cable (audio too, if running HDMI). The GeForce GT220 card has a 240Hz Max Refresh Rate and supports resolutions up to 2048x1536 with an analog connection and up to 2560x1600 with a digital connection. · Page 6 - Tom Clancy's H.A.W.X.